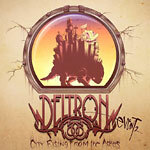 More than a decade after releasing their landmark, album, Deltron 3030, master lyricist Del the Funky Homosapien, virtuoso turntablist DJ Kid Koala and superproducer Dan ''The Automator'' Nakamura are gearing up for their eagerly awaited, second group full-length, EVENT II, to be released October 1, 2013. The City Rising From The Ashes EP presents three tracks from Event II. This CD is the only physical release of the preview EP. When you pay $2.00 (plus shipping) you get the preview EP with a coupon enclosed, good for $2 off the price of EVENT II. When you order EVENT II please be prepared to present the coupon physically or virtually. Please note: quantities of the preview EP CD were very limited. We are sold out.